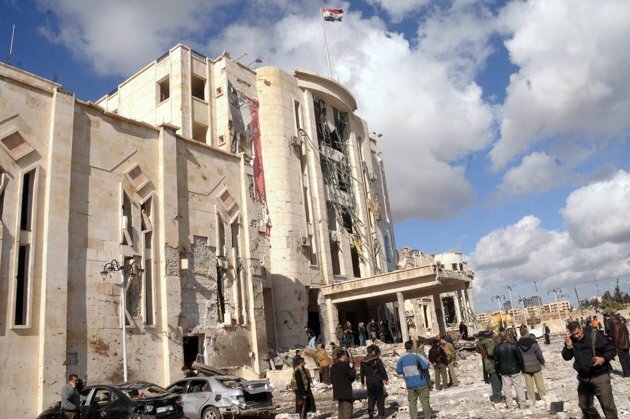 February10, 2012 – SECOND POST – FREE SYRIAN ARMY TERRORISTS TAKE CREDIT FOR TWIN SUICIDE EXPLOSIONS IN ALEPPO. The Free Syrian Army led by redneck rebel, former Col. Riad Al-As’ad, has officially claimed “credit” for a twin suicide bombing of the Syrian Military Intelligence Bureau in “New Aleppo” quarter which has, so far, resulted in the deaths of 25 military guards and innocent civilians. The evidence right now as reported by a source in Aleppo is that the driver in the first blast was a Libyan mercenary funded by Prince Hamad of Qatar. The second driver is unknown but is probably also a non-Syrian salafist. The Qatari role is suspect because that country and its corpulent hog prince have been identified trying to recruit Libyan savages still aching for war. The Qatari government, it is reported, offers up to $100,000.00 U.S. dollars to these terrorists and will pay double that in the event of death to the terrorist’s survivors. The U.S. and Qatar are close allies and are coordinating support for terrorism. We, at SyrPer, doubt the role of the FSA in this operation for the following reasons: Firstly, the FSA is conducting planning in the Province of Hatay under the noses of very curious Turkish military intelligence agents. SyrPer does not believe that P.M. Erdoghan has flipped his lid to the extent of allowing PKK-type terrorist operations to be planned and executed from his jurisdiction. We also believe that Erdoghan is personally sensitive to charges that he would condone killing muslims in this fashion. Secondly, the FSA is not a part of the jihadist movement and has no members who would be prepared to kill fellow Syrians and (most crucially) themselves in order to incur the hatred of Aleppo’s citizenry. Would you buy a used car from this rube? Probably not. 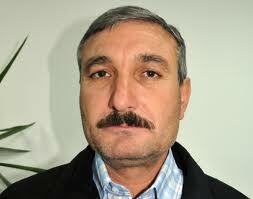 This is disgraced Riad Al-As’ad who leads the 60-strong Free Syrian Army. He lives in Hatay Province, Turkey. The FSA has tried to portray this operation as a “military” one characterized by precise targeting of the Syrian Mil. Intel. Building. The evidence on the ground argues the contrary. The vans used to detonate the plastic explosives contained the remains of the perpetrators with the vector of the explosion emerging from the vans. The second van was probably detonated in order to increase casualties a la Iraqi terrorism. The BBC reported from Beirut that there might have been a third explosion, however, my source tells me he heard only two while watching t.v. in the Sulaymaniyya Quarter in Aleppo. The location of the explosion, the New Aleppo District, is interesting only because it is an upscale area with a dense security presence. My source told me that Mil. Intel. under the command of Lt. Gen. Abdel-Fattah Qudsiyyeh, is now investigating the crime with an eye to locating facilitators. The scenes of carnage are unspeakable and I wish the state-run news programs in Syria would not be so graphic. The scenes of death have inspired many people to renounce any support for reforms, asking that the security the citizens formerly enjoyed by reinstated. From speaking to George I could detect palpable anger and a desire for revenge. We at SyrPer wish the Syrian government the best success in hunting down the criminals’ confederates and putting them on Gallow’s Road. As I write this blogpost, information coming from Homs is that fighting has been reduced as of 7:45 p.m., Syrian time, and that elements of Syria’s special forces have been spotted concentrating behind supply trucks near Baba Amro. This is hard to confirm because I heard it from only one source in a village near Homs. But, it cannot be doubted that the president wants this city cleansed of vermin and none too soon. The Russians, in our opinion, have privately told him to “go for it” and not to worry about any repercussions. It wasn’t the veto at the U.N., it was the SNC’s refusal to work with Moscow to end the conflict that brought Pres. Medvyedev over completely to Dr. Assad’s side. Reports of fighting in the South appear to be exaggerated. Every contact has told me that he or she had no evidence of any action in Dera’a Province. Zabadani is all but over now with Syrian tanks of the Republican Guard commanded by Maj. Gen. Hafez Makhlouf asserting full government control over the scenic town after some pretty heavy bombing two nights ago. Some of the citizens of the town will have a lot of explaining to do about weapons left behind in their homes by the terrorists. One home, I was told, contained night-vision equipment, a very valuable commodity to leave behind. The prevailing opinion of my sources in both Lebanon and Syria is that Qatar and Saad Hariri are financing these purchases and smuggling them into Syria via Lebanon’s Bekaa Valley. It’s amazing how easy it is to get night vision goggles if the U.S. is not interdicting their delivery. If Hizbollah tried to obtain the same equipment, the U.S. would be dancing with a bee in its bonnet. So much for civilized behavior. Lebanese residents of the U.S. have been arrested and charged with serious federal felonies for trying to smuggle these goggles to Hizbollah. If only they tried to send them to Syrian terrorists.